Bahujan Samaj Party (BSP) supremo Mayawati on Friday alleged that the 'Bharat Bandh' organized against the amendment to the SC/ST (Prevention of Atrocities) Act, was in fact "a conspiracy of the BJP" and an "event orchestrated by the Rashtriya Swayamsewak Sangh". In a statement, the Dalit leader said a conspiracy was being hatched by the ruling party to divert the attention of the people from various burning issues like the fuel price rise and the falling value of the Indian Rupee against the US dollar. She added that the country was already suffering the consequences of the wrong economic policies of the Bharatiya Janata Party - led NDA government and alleged that the same forces were now trying to play "dirty politics" on the issue. Defending the amendment to the Scheduled Castes and Scheduled Tribes (Prevention of Atrocities) Act, the four - time Uttar Pradesh Chief Minister further said that it all depended on the mentality of the government on whether the Act was misused or not. She cited the example of her four governments in Uttar Pradesh and underlined how she ensured that the Act was not abused to harass anyone or any caste. The people, she added, were more hassled by rising fuel prices, the dropping Indian Rupee than such issues which were nothing more than a ploy to deflect people's minds from such issues and the failure of GST and demonetization. These issues, she added, had triggered unrest among the people and erosion of BJP's voter base across the country. Mayawati also sounded a word of caution for the OBCs saying that the BJP and RSS opposed reservation to them in government jobs in 1990 and were now trying to hoodwink them by making tall promises and positioning them as champions. 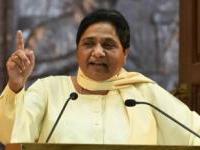 "The BJP is trying to foment trouble by inciting casteism and violence, " the BSP chief said. "I am warning the people to be very cautious of such divisive plans and casteist politics and urge them not to fall prey to it. "